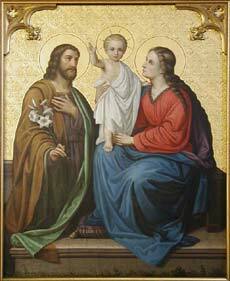 Today is the celebration of the Feast of the Holy Family. It is usually celebrated the Sunday after Christmas, but since this year the Sunday after Christmas is January 1 (Feast Day of Mary, Mother of God), the celebration was moved to Friday. You are to be a family, to be that presence of Christ to each other. God has sent the family to be His Love. Love each other tenderly as Jesus loves each one of you. to be the joy of our life. to see how much peace is in your family. Thoughtfulness is the beginning of great sanctity. If you learn this art of being thoughtful, you will become more Christ like, for His Heart was meek, and He always thought of the needs of others. If we also have that kind of thoughtfulness for each other, our homes would really become the abode of God most high.